Oscar Pistorius will get another chance to run at the Olympics after South Africa won an appeal to advance to the 4x400-metre relay final despite a crash in the heat. Oscar Pistorius and his South African teammates are moving on to the 4x400-meter relay final at the Olympics without even finishing the heats. The double amputee will get a chance to run for an Olympic medal after track officials awarded an extra spot in the final following a successful protest by South Africa. In the opening round Thursday, a Kenyan runner collided with South Africa's Ofentse Mogawane as he made his way around the final bend in the second leg of the race. Mogawane fell and clutched at his left shoulder as the baton rolled away. Set to run next in the relay, Pistorius stared at the scene in disbelief. He put his hands on his head and began walking off the track, figuring his time in London was done. In the span of two hours, Pistorius went from crestfallen to celebration. On Twitter, he said, "IT'S ON!! We in the FINAL." Following the race, Kenya was disqualified from the competition when the referee ruled that Vincent Mumo Kiilu cut across too soon and caused Mogawane to fall. Kiilu had a spike mark on the back of his right shoe and Mogawane dislocated his shoulder. Track and field's governing body said Pistorius' team will run in an outside lane after the jury met and "agreed to advance the South African team, even though they did not finish the race, considering that they had been severely damaged in the incident with Kenya." Originally, three teams from the two heats were supposed to advance automatically, along with the next two fastest times. The last lane was going to be empty. The Bahamas, the U.S., Britain and Trinidad and Tobago were among the other qualifiers. Willem Coertzen was competing in the decathlon and glanced up after Mogawane hit the track, but wasn't aware of South Africa's inclusion in the relay final until after he'd finished pole vault. "I'm ecstatic," said Coertzen, who is South African. "I haven't seen it happen before like that, could be something new, but I'm excited for them. After everything that (Pistorius) has been through, good luck to him." 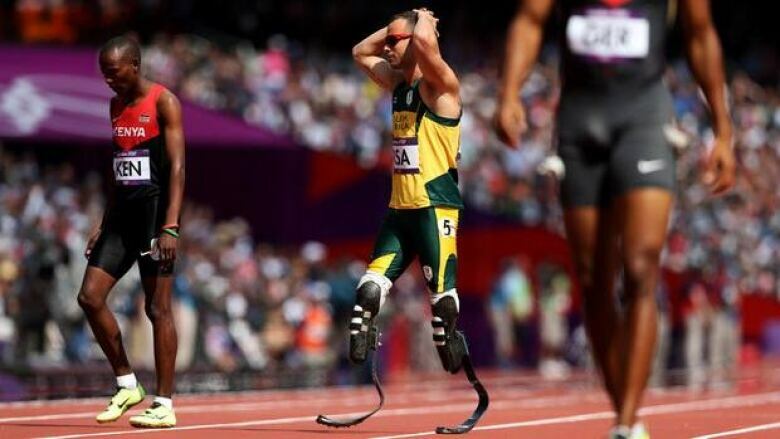 This was quite a day for Pistorius. After a long battle for inclusion in able-bodied competition in the individual events, Pistorius ran the 400 meters and advanced to the semifinals before finishing last in his heat. Last week, the IAAF announced he could run any part of the 4x400 relay at the Olympics, not just the opening leg when runners have to remain in their assigned lanes for a lap. "This whole experience was one of the highlights of my career," said Pistorius, the first amputee to compete in track at the Olympics. "I just had the most amazing experience representing my country. My experience here, everything has been superb. From the organization to the crowd to the fans and to friends. I couldn't have hoped for a better time. "It's so hard. You have so much support from back home. We would have loved to have represented our country today and finished the race." Now, as it turns out, Pistorius and his teammates will get that chance. "Will be up on the 3rd leg tomorrow for the Final! Really can't wait!" he posted on Twitter, adding "Emotional roller coaster!" Manteo Mitchell heard the POP! and knew it wasn't good. "It felt like somebody literally just snapped my leg in half," he said. The American sprinter had 200 metres to go in the first leg of the 4x400-metre relay preliminaries Thursday and a decision to make: keep running or stop and lose the race. To him, it was never much of a choice. He finished the lap and limped to the side to watch the Americans finish the race and qualify easily for the final. A few hours later, doctors confirmed what he suspected: He had run the last half-lap with a broken left fibula. "I heard it and I felt it," Mitchell told The Associated Press. "But I figured it's what almost any person would've done in that situation." Mitchell finished his heat in a more-than-respectable 46.1 seconds, and the United States tied the Bahamas in the second heat in two minutes, 58.87 seconds — the fastest time ever run in the first round of the relay at the Olympics. The 25-year-old sprinter from Cullowhee, N.C., said he was diagnosed with a complete break of the left fibula — but it was not a compound fracture and the bone is expected to heal on its own in four to six weeks. He knew what the stakes were when he lined up to run the first leg of his first Olympics. The Americans have won gold in the last eight long relays they've entered at the Olympics. "Even though track is an individual sport, you've got three guys depending on you, the whole world watching you," Mitchell said. "You don't want to let anyone down." He said he slipped on the stairs a few days ago in the athletes village but didn't think much of it. Training went well and he felt good when he lined up to kick things off for the Americans. He said he was feeling great, as well, when he looked at the clock while approaching the 200-meter mark, somewhere in the high-20 or low-21-second range. "I was doing my job," Mitchell said. "But probably at 201 meters, I heard it and I felt it." He credited something more than simple adrenaline for pushing him the rest of the way around the track. "Faith, focus, finish. Faith, focus, finish. That's the only thing I could say to myself," he said. Mitchell was a promising high school football player at Crest High School in Shelby, N.C., when another broken bone altered his career. He broke his left arm, and his coaches — seeing the natural talent — pushed him over to the track. Western Carolina coach Danny Williamson saw Mitchell finish second several times to a future Olympian, Travis Padgett, and offered a scholarship. "He was a team person here," said Williamson, who received the first call from Mitchell after he got off the track Thursday. "As soon as he came to Western Carolina, no matter what the situation, he'd do anything we asked of him." On the world's biggest stage, Mitchell took the team-first thing to a whole new level. He is the 2012 version of Jack Youngblood, the Rams linebacker who played the Super Bowl on a broken leg. Or Tiger Woods, who won the 2008 U.S. Open on a broken leg. Or, maybe most appropriately, Kerri Strug, whose vault on a sprained ankle sealed the first-ever Olympic team gymnastics gold for U.S. women at the 1996 Atlanta Games. "I don't know how you write this, but I'd like to believe the only way he would have stopped is if the leg had fallen off," Williamson said. Mitchell will spend the rest of the Olympics, and beyond, in a walking boot and on crutches. He'll be at the stadium to watch Friday's final. The United States is no shoo-in to win a medal this time, because LaShawn Merritt and Jeremy Wariner — Olympic gold medalists in 2004 and 2008 — are also both out with injuries. But the medals ceremony is Saturday, and if the U.S. finishes in the top three, Mitchell would get one, too, since he ran in the preliminaries. Forgive him if he doesn't leap onto the podium, though. "I pretty much figured it was broken, because every step I took, it got more painful," he said. "But I was out there already. I just wanted to finish and do what I was called in to do." On the Olympic track: Would you keep running on a broken leg?